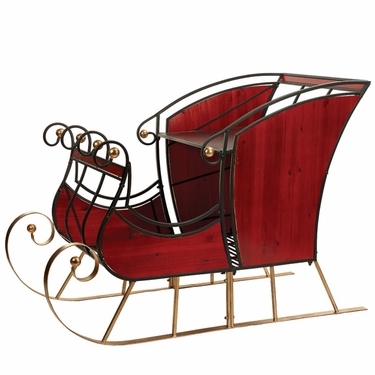 Nothing brings the holiday’s home like our new, beautifully crafted Large Glossy Red Sleigh! The perfect addition to your holiday decor, you will awe your friends and family. This metal and wood sleigh is lovingly painted red and includes elegant golden scroll work and tiny touches of black detail. You will find plenty of room inside for colorfully wrapped presents, or you can set the scene for that perfect holiday photo for you and your family, and even all the neighborhood children! Our Large Glossy Red Sleigh is the ideal centerpiece for your holiday festivities. Bring the magic to your home and oh what wonderful memories this sleigh will bring! Red Christmas Mailbox | Christmas Santa Mailboxes (Set of 2) | Red Santa Mailboxes (Set of 3) | Vintage Christmas Mailboxes (Set of 3) | 64" Red Metal Sleigh | 64" Silver Metal Sleigh | White Wood & Metal Sleigh | Large Forest Sleigh | Large Glossy Red Sleigh | Large Victorian Christmas Sleigh "LUCIANA" | Large Christmas Sleigh "PHILADELPHIA" | Large Red Plane Decor | Medium Christmas Train - Red | Large Christmas Iron Train w/Cart | Large Iron Red "CHARLESTON" Truck w/LED Lights | Large Fire Truck Engine Decor | 70" Blue Christmas Nutcracker w/Drum "Marloni" | 70" Red Christmas Nutcracker w/Staff "Nicholas" | 59" Blue Iron Christmas Nutcracker w/Trumpet "Harold"